Are you a fan of swashbuckling tales of adventure on the high-seas? Are you a fan of One Piece who wishes there were more manga about pirates? Do you trust the word of the Young Adult Library Association when it comes to selecting titles for its’ annual Great Graphic Novels For Teens list? If the answer to any of these rhetorical questions is a hearty “Aye!”, then you would do well to pick up a copy of Destiny’s Hand as soon as possible. Set in a fantasy realm where magic is real and pirates still roam the oceans, our story centers upon a young woman named Olivia. Ill-suited to the idle life of a noble’s daughter and ill-pleased at the prospect of being married off to a total stranger, Olivia is more excited than terrified when the ship taking her to meet her betrothed is attacked by Captain Blaine – gentleman pirate and master of the unsinkable ship Destiny’s Hand. Impressed by Olivia’s courage and honor, as she challenged the bosun Diego to a duel and then spared his life when she won, Captain Blaine promises Olivia a boon should she ever need it. She immediately requests safe passage and a place on his crew – a boon Captain Blaine is happy to grant. Three years later, Olivia has grown into a fine woman and is but one of the many colorful characters making up the crew of Destiny’s Hand. But all is not well, for Captain Blaine and his magical ship have many secrets and a prophecy to fulfill. And when an injury leaves Captain Blaine crippled, it will fall to Olivia to become the pirate captain she always dreamed of being and lead her crew of misfits on a quest. For evil men on both sides of the law seek the power of The Devil’s Eye – a magical gem with the power to destroy whole cities and fleets. And the magic of Destiny’s Hand may be the only thing that cave save the world. 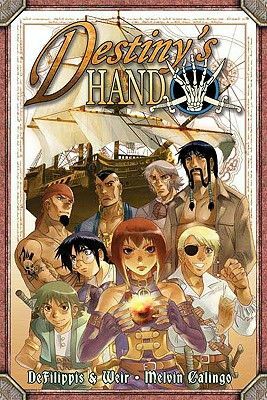 It would be easy to compare Destiny’s Hand to the Pirates Of The Caribbean films as both have intricate plots with many interesting characters and a good deal of common themes. But for my money, Destiny’s Hand has better developed characters and much better pacing when it comes to its’ action scenes. Olivia is far more realized than the standard “tough-chick” heroine and fans of the works of Tamora Pierce and L.A. Meyer will likely find her to be the equal of Beka Cooper or Jacky Faber. The rest of the supporting cast is equally fleshed out. Artistically, this is one of the best books I’ve read in recent memory. The visual storytelling is flawless, with the action flowing smoothly from page to page and there being virtually no confusion about panel order. The characters are as distinctly defined visually as they are in terms of personality. All in all, I’d say this book is a must-have for any Young Adult or Teen graphic novel collection. Fans of action, fantasy and pirates will all enjoy it. Young women looking for a story with a heroine who doesn’t sit around waiting to be rescued will enjoy it. Quite frankly, I’m hard pressed to think of anyone who wouldn’t like this book except for those sticks-in-the-mud who don’t like pirates.